To 4K-5KW motor. KLS controller is supposed to reduce the noise of BLDC motor,especially for hub motor.The BLDC motor must be based on 3 hall sensors.Customers can program the KLS controller on PC software or Android App.You may need a Z-TEK USB to RS232 cable for programming the controller if you want to program the controller on Android Tablet. 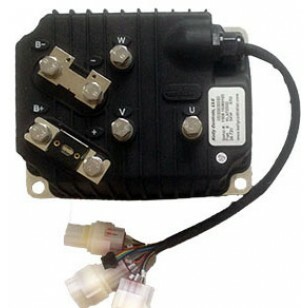 •Controller supply voltage range: PWR, 18V to 90V for controllers rated equal or lower than 72V. •Motor Current Limit, continuous: 140A ,depending on the model. •Motor Current Limit, 10 seconds boost: 350A ,depending on the model. •Supply Current, PWR, 30mA Typical. •Standby Battery Current: < 0.5mA. •5V Sensor Supply Current: 40mA. •Configurable battery voltage range, B+. Max operating range: 18V to 1.25*Nominal Voltage of Battery. •Standard Throttle Input: 0-5 Volts(3-wire resistive pot), 1-4 Volts(hall active throttle). •Throttle Input: 0-5 Volts. Can use 3-wire pot to produce 0-5V signal. •Full Power Operating Temperature Range: 0℃ to 70℃(MOSFET temperature). •Operating Temper ature Range: -40℃to 100℃ (MOSFET temperature). •Max Battery Current : Configurable. (1)Extended fault detection and protection. The LED flashing pattern indicates the fault sources.Customers can read the error code in PC software or Android Tablet also. (2)Monitoring battery voltage. It will stop driving if the battery voltage is too high and it will progressively cut back motor drive power as battery voltage drops until it cuts out altogether at the preset "Low Battery Voltage" setting. (3)Built-in current loop and over current protection. (4)Configurable motor temperature protection range. (5)Current cutback at low temperature and high temperature to protect battery and controller. The current begins to ramp down at 90℃ case temperature, shutting down at 100℃. (6)The controller keeps monitoring battery recharging voltage during regen braking. (7)Maximum reverse speed and forward speed can be configured between 20% and 100% respectively and separately. (9)Provision of a +5 volt and +12 volt output to supply various kinds of hall sensors. (10)5 switch inputs which are activated by connection to 12V. Default to throttle switch, brake switch,reversing switch,forward switch and Boost switch. (11)2 analog 0-5V inputs that default to throttle input, and motor temperature input. (12)Copy signal of one of hall sensors. (13)Configurable boost switch. Enables the maximum output power achievable if the switch is turned on. (14) 12V brake switch input used different port from motor temperature sensor.You can use both brake switch and motor temperature sensor functions at the same time on the latest version.Pin 25 is 12V brake switch input port.Pin1 is motor temperature sensor input port. (15)Optional joystick throttle. A bi-symmetrical 0-5V signal for both forward and reversing. (16)Configurable motor over-temperature detection and protection with the recommended thermistor KTY84-130 or KTY84-150. (17)3 hall position sensor inputs. Open collector, pull up provided. (18) Brake analog regen mode.This regen mode doesn't need brake switch to support any more.Only available from software version 0106.KLS controller can not support reflashing. (19)Enhanced regen brake function. A novel ABS technique provides powerful and smooth regen.The regen can happen at any speeds until zero speed. (20) KLS-D controller included the fuse and shunt on the case. (22) KLS-D can support Broadcast type CAN Bus function.It is 250Kbps.CAN bus is not included in KLS-D controller by default. Caution! The regen is not a safe function.Usually you may use the mechanical brake. 2)Synchronous rectification, ultra low drop, fast SVPWM and FOC to achieve very high efficiency. 4)Voltage monitoring on 3 motor phases, bus, and power supply. 5)Voltage monitoring on voltage source 12V and 5V. 6)Current sense on all 3 motor phases. 10) Configurable limit for motor current and battery current. 12) Battery protection: current cutback, warning and shutdown at configurable high and low battery voltage. 13) Rugged aluminum housing for maximum heat dissipation and harsh environment. 14) Rugged high current terminals, and rugged aviation connectors for small signal. 15) Thermal protection: current cut back, warning and shutdown on high temperature. 16) Configurable 60 degree or 120 degree hall position sensors. Controller can do auto_Identification angle for different degrees of hall sensors. 17) Configurable high pedal protection: the controller will not work if high throttle is detected at power on. 18) Current multiplication: Take less current from battery, output more current to motor. 19) Easy installation: 3-wire potentiometer will work. 20) Standard PC/Laptop computer to do programming.There is one more choice for customers to program KLS controller.Standard Tablet with Android OS to do programming.Need a Z-TEK USB TO RS232 cable for connecting the controller to App program in Tablet. 21) User program provided. Easy to use. No cost to customers. 22) Support motors with any number of poles. 23) Up to 70,000 electric RPM standard. (Electric RPM = mechanical RPM * motor pole pairs;Motor pole pairs=Motor poles/2).